This year at Oshkosh was a bit different than previous ones, not just because we spent all week there but Dad and I spent a lot more time in Warbird Alley. Warbird Alley for those that aren’t familiar with Oshkosh, is the main area where all the warbirds are parked, including bleacher seats for veteran panels. Everyday the main staging area, which is a cement patch maybe 150ft by 200ft wide, changes so that a different selection of warbirds are present for people to walk around and enjoy. Behind the whole staging area is the grass static where the planes remain static before heading up in air. One evening while we were waiting down there, waiting for some of our friends to get back from a flight, I poked around with some of the symmetry going between the aircraft. That is one of the great things about airplanes is that there is always a great symmetry going on somewhere. 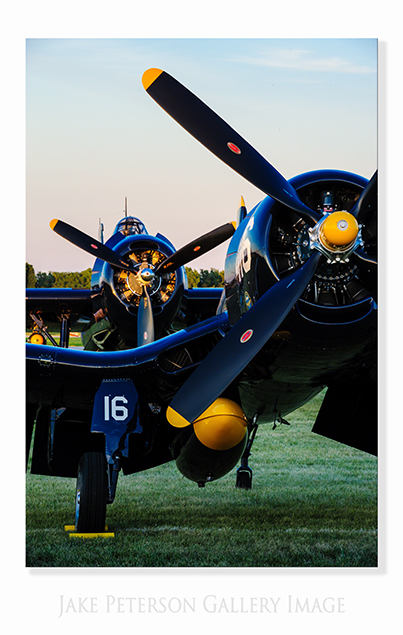 In this case it was the stackup of the F4U-4 Corsair and the TBM Avenger behind it. Nice evening light making a simple click.